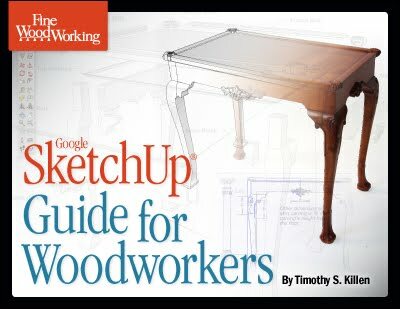 Heads up to all you woodworkers out there: Tim Killen, a contributor to Fine Woodworking.com’s Design-Click-Build blog has just released a brand new PDF e-book: Google SketchUp Guide for Woodworkers. Tim has been a big advocate of 3D design in the woodworking space and has been a good friend to the SketchUp community. It’s great to see that he’s combined his woodworking and SketchUp knowledge in a single volume for other woodworkers to benefit from. You can get his e-book from the publisher's store online. One more thing: We blogged about Tim's SketchUp work last year. Wow, well done to Tim on his new publication and thanks for bringing it to our attention...more to learn! In my humble opinion as a newbie in the use of SketchUp, this eBook from Fine Woodworking is excellent! The cost was low and the benefits were great. Going through the book and following the examples really helped increase my capabilities. I heartily recommend it to anyone who wants to know how to use SketchUp!